John Dennis Profumo was appointed Secretary of War by British Prime Minister Harold Macmillan in 1960. He had a good job with room for advancement, was married to retired actress Valerie Hobson, and together they were at the center of the fledgling Swinging ‘60s in-crowd. Life was good. One night at Lord “Bill” Astor’s Cliveden estate, Profumo was introduced to a guest of Dr. Stephen Ward’s, Christine Keeler. Within weeks, the two were embroiled in an intense affair, but it was over before the year was out. 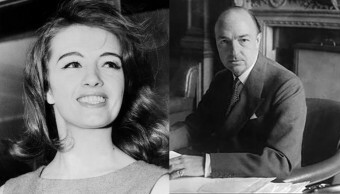 The world may never have known about Profumo’s indiscretion if a drug dealer hadn’t shot up the outside of Dr. Stephen Ward’s London flat in early 1963 when Christine Keeler, his ex-lover, locked him out. The incident and subsequent trial garnered a lot of press coverage, and rumors about Keeler and Profumo soon started making the rounds. Profumo’s bold rebuttal defused the hue-and-cry for a few short weeks. Then Stephen Ward went on trial in May to face charges of prostituting young women – including Christine Keeler. The trial was followed avidly in Britain and was the ruination of three men. Keeler testified under oath about her affair with Profumo. Keeler ended up with a perjury conviction in a related trial and went to jail in December 1963. Ward wrote a letter to Harold Wilson, leader of the opposition party in Parliament, and let him know that Profumo had lied to the House of Commons back in March. When Profumo returned to England from a holiday in Italy with his wife on June 4, he knew he was backed into a corner. On June 5, 1963, he ‘fessed up about his affair with Keeler, and that he tried to pull a fast one on Parliament. Then he resigned. Prime Minister Macmillan was urged by members of his own party to resign in the wake of the scandal. The consensus was that he handled the situation poorly, and the Conservatives didn’t want to suffer for his bungling. Alec Douglas-Home took his place, but Harold Wilson and the Labour Party took the general election in 1964. Dr. Stephen Ward attempted suicide by overdosing on pills and fell into a coma. While comatose, he was found guilty of the peddling prostitution charge, but died shortly after without ever regaining consciousness. John Profumo dedicated his life to philanthropic work in London’s East End. For his efforts, Queen Elizabeth II named him a Commander of the British Empire in 1975. He died on March 10, 2006 at the age of 91.